Denver roads take a beating during the winter months. Snow hits our roads hard, and sometimes it sticks around for an extended period of time. It can occasionally make travel very difficult even for those with all-wheel drive cars. Many states take a proactive approach to clearing the roads, which includes laying down salt to help melt ice pack that can form from melt and freeze cycles. While Denver doesn’t salt the roads, they do use something else. And it’s wreaking havoc on the residents’ cars. Enter magnesium chloride deicer. The deicer derives from magnesium, salt, and “anti-corrosive additives” that all gets sprayed onto the roads in liquid form. It’s a grayish substance (though color can vary) that’s very effective at keeping the roads ice-free. Unfortunately, it’s also excellent at corroding away precious metals and plastics on your vehicle. This is where the problem begins. Since the substance is liquid (versus salt’s solid crystals) it penetrates nearly every inch of your car’s undercarriage. So what’s the deal with magnesium chloride deicer and how can you avoid problems? Let’s take a look. As we mentioned above, magnesium chloride deicer is very efficient at preventing ice buildup. It keeps our local roads open and ensures everyone gets to work, school, and the great outdoors. The reasoning behind using the deicer in the first place is its ability to better defrost roads when compared to salt, or nothing at all. In 1996 Colorado first used magnesium chloride on I-70 and saw 46 fewer closures than the previous year. The liquid form that damages cars is also the most efficient way to keep roads clear. Where salt bounces off the road, magnesium chloride stays put. This means better coverage and more ice melt. When to comes to clearing roads it does its job and does it well. However, people have made arguments against its safety for both the environment and vehicles. A few years after its implementation in 1996, Basalt, Aspen, and Summit County all banned magnesium chloride deicer, citing environmental and safety concerns. And while the health and environmental impacts have been largely dis-proven, the corrosive effects on vehicles remain. As we mentioned above, magnesium chloride’s downfall is its corrosiveness. It eats through metal and rubber very quickly. This means no vehicle’s exposure to the substance goes without some damage. This is very important to understand. Axles, wires, nuts, brake systems, ball joints and more can all suffer due to corrosion caused by magnesium chloride. Damage to a corrosion weakened ball joint or axle while driving means you are likely going to be in an accident. And even if the worst doesn’t occur, undercarriage rust can lead to eventual minor problems like leaking oil pans and exhaust systems. Plus, rust can eat a hole straight through your car’s frame or body panels. 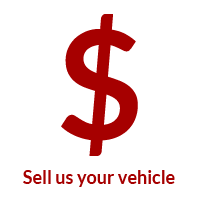 Worst case scenario, a serious accident occurs, and best case you’ll lose resale value on your car. With the number of luxury cars on Denver’s streets, that amounts to a significant monetary loss. Of course, that loss isn’t set in stone. You can combat much of the damage done by magnesium chloride deicer with a few simple steps. It’s all about knowledge and diligence. Protecting your vehicle from magnesium chloride deicer takes diligence. It’s something that becomes a real pain, but a necessary pain. The thing is, Denver won’t stop using the deicer any time soon. It’s simply too effective at what it does, and the price is right. We understand this, prioritize human safety, and always appreciate a low price. But that doesn’t mean we aren’t interested in keeping our cars corrosion free. First and foremost, a car wash is the first line of defense against magnesium chloride deicer. If you’re only willing to put in the smallest amount of effort, make it a monthly car wash. Though for those who’re very concerned with keeping their car corrosion free you’ll want to visit the wash during every cold and snowy spell. Corrosion takes time to set in, which works in our favor. Bring your vehicle to the car wash after every snowy stretch, and twice during longer spells. Colorado’s frequent freezes followed by beautiful, warm, sunny days make it easy to keep up with the washing. Though before you pick any old wash make sure the business you’re visiting has appropriate undercarriage washing. Car washes without strong enough or comprehensive enough undercarriage coverage can leave magnesium chloride residue on the bottom of the car. That residue will build up and eventually lead to corrosion. While an undercarriage car wash is mandatory to clean your vehicle’s undercarriage you can also help keep the deicer off of your body with an at home car wash. Simply take some warm water, soap, and sponge (or a hose) and wash down your car. Magnesium chloride deicer doesn’t harm paint, but even the smallest chip in your paint job is all it takes for the liquid to seep beneath the finish and cause real rust damage. The at-home wash can also supplement trips to the car wash during snowy stretches. Even a good hose spray under the car or on the tires can help wash off some magnesium chloride. If washing at home isn’t an option (and it isn’t for many) make sure to either wax your car yourself or opt for the extra car wash coat of wax. The wax helps keep the magnesium chloride deicer from getting into any chips or other dings in your paint job. Most car wash wax treatments are nominally priced and more than worth the money. Protecting your car from magnesium chloride deicer really starts and stops with the car wash, but there is one other preventive measure that can help save your car from corrosion. Certain sealants can cover plastic wire-harnesses and other plastic components vulnerable to magnesium chloride’s corrosive effects. Spraying these on before the winter can help prevent damage before it starts. Magnesium chloride’s effects aren’t always as obvious as a giant rust spot or failing brake systems. Sometimes, the problems aren’t apparent, or they masquerade as another problem. Case in point, the check engine light. It comes on for a variety of reasons that usually amount to a nondescript reading that tells us little about the actual problem. Though if that nondescript reading has something to do with an electrical component it’s possible that magnesium chloride is the culprit. The corrosive liquid gets into every nook and cranny under the hood which can lead to failing wires. The shorted wires send a code that triggered your check engine light. Your car probably isn’t dying right away, but rather falling victim to magnesium chloride deicer. Getting your brakes checked should always rank high on the to-do list. New brakes save lives, not to mention rotors and calipers. Always get your brakes serviced right away after hearing the tell-tale grinding of the brake pads. While you’re at it, it’s also worth telling the mechanic in question to keep an eye out for corrosion near your brake lines or calipers. The brake system uses pressurized fluid to function and corrosion can cause leaks. Leaks cause a drop in pressure which hampers your braking distance and eventually causes a total system failure. Catching the corrosion early means treating the problems before it turns into something more sinister. The last thing you need is a blown brake line during rush hour traffic. Yearly tuneups represent the easiest way to catch corrosion problems before they become too extensive. Plus, they’re a great way to keep your vehicle running smoothly. Always ask your mechanic to check for corrosion during your tune-up. It helps to schedule theses after the winter, as that’s when the corrosion damage actually occurs. Removing and replacing any damaged parts can ensure your car runs great for the rest of the year. 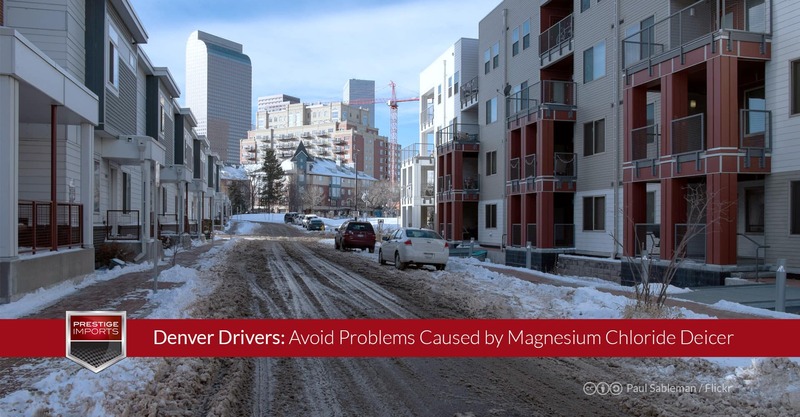 While magnesium chloride deicer is an unfortunate reality here in Denver, it doesn’t mean you can’t keep a new car in good condition. Following the tips above can ensure your vehicle avoids damage. 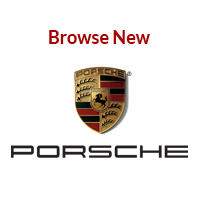 If you’re in the market for a luxury car in the Denver area, get in contact with us. 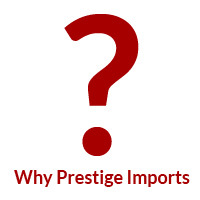 Our staff has years of experience and the insider knowledge to get you set up with the best car for the Denver area. 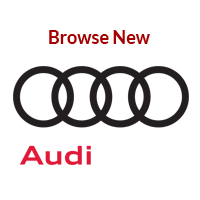 Let us help you get into your new Porsche or Audi today!